This Swedish pop band achieved their breakthrough in 1993 with the worldwide number 1, "All That She Wants". The comparisons to a fellow Swedish band seemed obvious - two female vocalists, one blonde, one brunette, and two male musicians, playing catchy dance-inflected pop music. The band, who originally recorded as Tech Noir, was formed by two sisters, Malin Berggren (Born 31 October 1970, Gothenburg, Sweden; vocals) and Jenny Berggren (Born 19 May 1972, Gothenburg, Sweden; vocals), and their brother Jonas Berggren (Born 21 March 1967, Gothenburg, Sweden; programming), with fourth member Ulf Ekberg (Born 6 December 1970, Gothenburg, Sweden; programming). Before their breakthrough the sisters sang in church choirs in their native Gothenburg, while brother Jonas and close friend Ekberg perfected their expertise in new technology. Their chart-friendly combination of pop and reggae was further revealed on "Wheel Of Fortune", "Happy Nation", "Waiting For Magic" and the hugely popular "The Sign" (US number 1/UK number 2), while their debut album went to number 1 in six countries, selling over 21 million copies. They enjoyed further worldwide success with "Don't Turn Around", a cover version of Aswad's pop-reggae standard. Their second album, The Bridge, was released at the end of 1995 and saw the band move away from reggae basslines to encompass more mature, considered songwriting. While "Ravine" expressed their Christianity, "Experience Pearls" saw them move in the direction of sophisticated Euro pop. It was far from the unholy music experience some critics imagined, despite the band's continued inability to negotiate English-language lyrics with anything approaching subtlety. They debuted at UK number 5 in August 1998 with the catchy "Life Is A Flower", and enjoyed transatlantic chart success with a cover version of Bananarama's "Cruel Summer" (US number 10/UK number 8) The attendant album was a disappointingly bland affair. 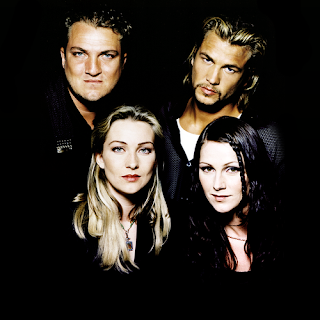 The following year's singles compilation (and its US counterpart) provides the perfect way to enjoy Ace Of Base's innocuous Europop. Happy Nation (Mega/London 1993)***, The Sign US only (Arista 1993)***, The Bridge (Mega/London/Arista 1995)***, Flowers (UK) Cruel Summer (US) (London/Arista 1998)**. Singles Of The 90s (Polydor 1999)****, Greatest Hits (Arista 2000)****, The Collection (Spectrum 2002)***. Happy Nation: Home Video (Mega 1993), The Sign: Home Video (Arista 1994).